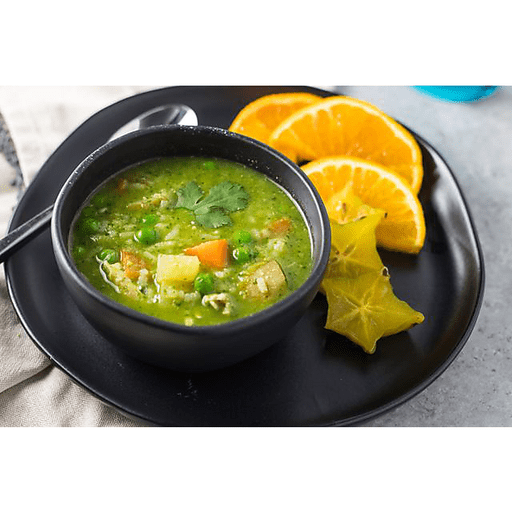 Based on the South American dish, Aguadito de Pollo, this filling Peruvian Chicken and Rice Soup is packed with veggies and color. Fresh cilantro, smoky poblano pepper and root veggies add layers of flavor and make this dish extra delicious! 1. Heat oil in a large skillet over medium high heat. Add diced poblano and onion. Saute for 5 minutes or until onions start to turn translucent. Add serrano and garlic and saute for 2 minutes more. Remove from heat and set aside to cool. 1. To a soup pot, add chicken stock, potatoes, carrots, chicken and rice. Bring to a boil over high heat, then reduce heat and simmer for 15-20 minutes, or until veggies are tender and rice is cooked.⠀ 1. Once pepper mixture has cooled, transfer to blender. Add cilantro, lime juice and water. Blend 1-2 minutes or until smooth.⠀ 1. Once soup veggies and rice are cooked, stir in frozen peas, cumin and cilantro mixture. Cook until peas are warm. Season with salt and pepper and serve. Per Serving: Calories 260, Total Fat 6g (Saturated 1.5g, Trans 0g), Cholesterol 40mg, Sodium 190mg, Total Carbohydrate 28g (Dietary Fiber 4g, Sugars 3g, Includes 0g Added Sugars), Protein 23g, Vitamin D 0%, Calcium 2%, Iron 10%, Potassium 8% *Nutritional values are an approximation. Actual nutritional values may vary due to preparation techniques, variations related to suppliers, regional and seasonal differences, or rounding.